THANK GOD it’s October! I am so super ready for Philly’s amazing falltime weather with low humidity, crunchy leaves on the ground, and of course lots and lots of PUMPKIN recipes!! I’ve already had it in cookies, in my coffee, even pumpkin pie martinis. Loving it! I was super excited to have found this new Pumpkin Pie SMOOTHIE recipe on my Secret Recipe partner’s website this month. How good does that sound? and more importantly, why haven’t I thought this up yet?! The Secret Recipe Club is a really cool group I joined last winter. Every month, we are assigned a new blogger. This month, I was paired up with Chris & Rachel’s blog called “The Keenan Cookbook“. We get to pick ANY recipe that blogger has written about and cook it up ourselves. We can make adjustments according to our tastes too. All of the bloggers post their results on the same day and we all get to see who had who and more importantly, what delicious dishes were made! It was seriously so difficult to choose just one recipe for this month. Chris and Rachel’s recipes are all so amazing! They have the cutest family and I also loved reading all of their stories. I ended up absolutely having to pick the pumpkin recipe since it’s October and all… and because it just sounded SO GOOD! 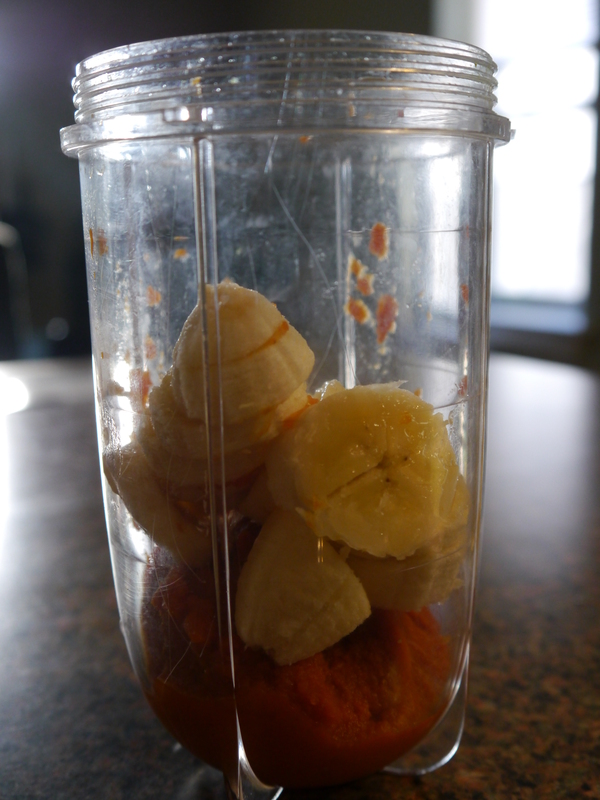 Put all ingredients into a small blender and blend until smooth. Add a tablespoon at a time of skim milk if it is too thick. So- this recipe tastes amazing. I mean what could be bad?! Honestly, I ended up making it every single day last week for breakfast. Tee Hee Hee! The only thing I would do for the next time I make it is to maybe try to do it with some Greek Yogurt or Vanilla Protein Powder? This recipe is definitely missing some protein if you’re trying to eat it for breakfast. If you want it as dessert (what a great idea!!) you should probably keep it as is. YUM! Check out these other amazing recipes from this month’s SRC Reveal! I tried it with the protein powder and it still needs something. Probably a lot more sweetener. YUM- love the fall flavors! This sounds delicious…. loving all the pumpkin recipes! 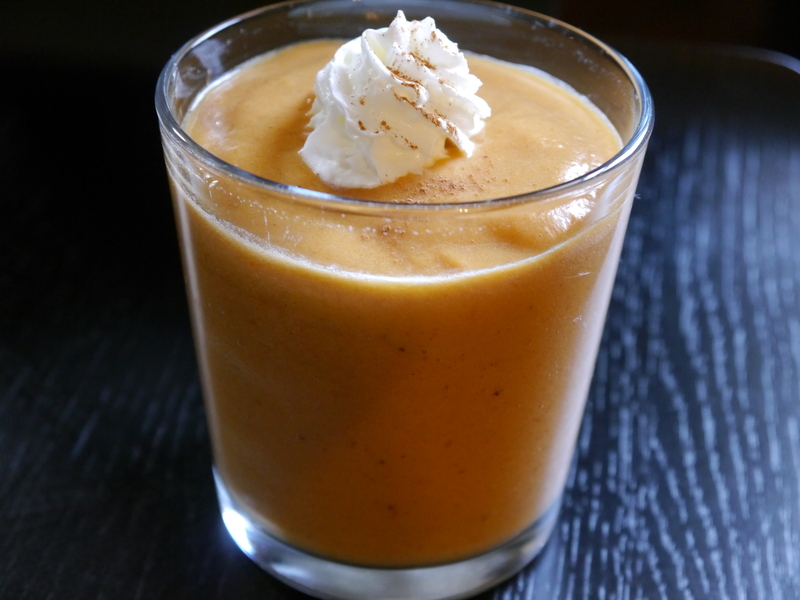 who would have ever thought of a pumpkin pie smoothy. Yum! This smoothie sounds totally awesome – yum! I love anything made with pumpkin. What an awesome smoothie! Everyday for a week? That’s saying something. Wow. Thanks for sharing with the SRC. I till definitely give this a try soon.